For this challenge I had some fun with fondant and made this nature inspired cake with a fresh green herb buttercream frosting and a cloud of whipped cream. This was my first time working with fondant. I'm experienced in sculpting, however, so it wasn't much of a leap from inedible materials to this. I like to let materials play out organically and I found the fondant to be perfect for it. I didn't do any carving to create shapes. 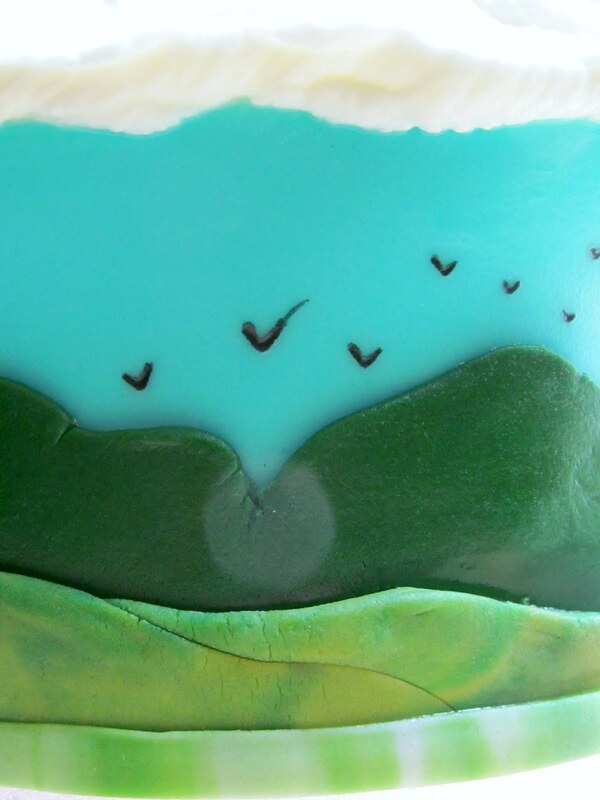 Instead, I pressed out rough jagged ropes of fondant and let the hills and trees form out of the natural folds and creases. 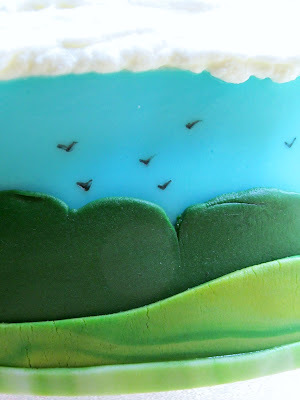 Another technique I used was to stop mixing in the food coloring before it was fully integrated to give the fondant a painted look for the rolling hills. 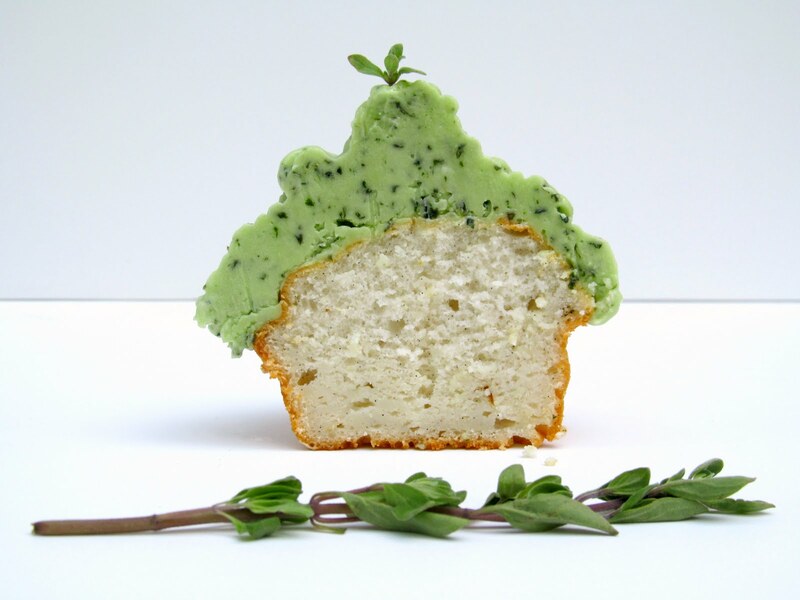 This cake inspired the idea for the herb garden frosting, which I'd never heard of or made before -but certainly will add to my list of go to frostings! I used marjoram, basil, mint and tarragon in a simple American buttercream. 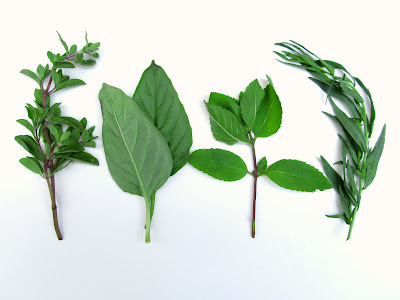 I imagine lemon thyme, pineapple sage, rosemary and just about anything from your herb garden would fit in beautifully. Another new dessert making tool I used today was a fine-tipped black food writing pen to draw in the little flocks of crows. I'm still putting flocks of birds in every sky I draw or paint like I did as a kid. I don't think I'll ever get over it. And the good news: I used store bought white cake mix and fondant for this project so there's not much in the way of a recipe to give besides the buttercream! For the cake, I used a 6 inch spring form pan and sliced the cake in half to make two layers, because I wanted to make a small cake. I would suggest a little lemon zest in the cake batter! I used the extra batter I had to make cupcakes for my left over buttercream. They were yummy treats along the way today. I dyed white fondant with sky blue and goldenrod gel food coloring that I got at Michaels. I mixed them in various degrees for the different shades of green. Everything I did with the fondant was an experiment, so I used little pieces to do tests, took my time, and just really "rolled" with it. Turn up mixer to high and beat until light and fluffy. Fold in herbs until well incorporated. The flavor will intensify a bit after it rests. Frost your cake with the buttercream and allow it to rest while you work on the fondant. If it's a hot day, put it in the fridge. Use a tape measure around the cake to plan out the fondant components you will need. Prepare all of your fondant (according with the directions and tips on the package) and set aside each piece as you complete it. Glue your fondant to the cake using a thin layer of honey, as I did, or gum paste. 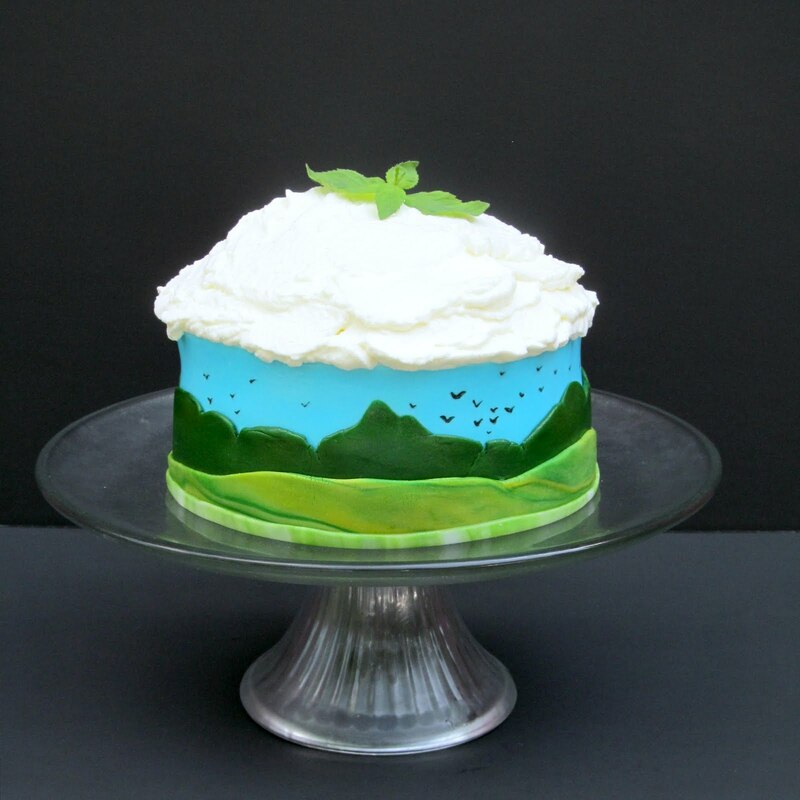 Top your cake with spoonfuls of fluffy white whipped cream and garnish with fresh mint. I know this recipe is minimal. 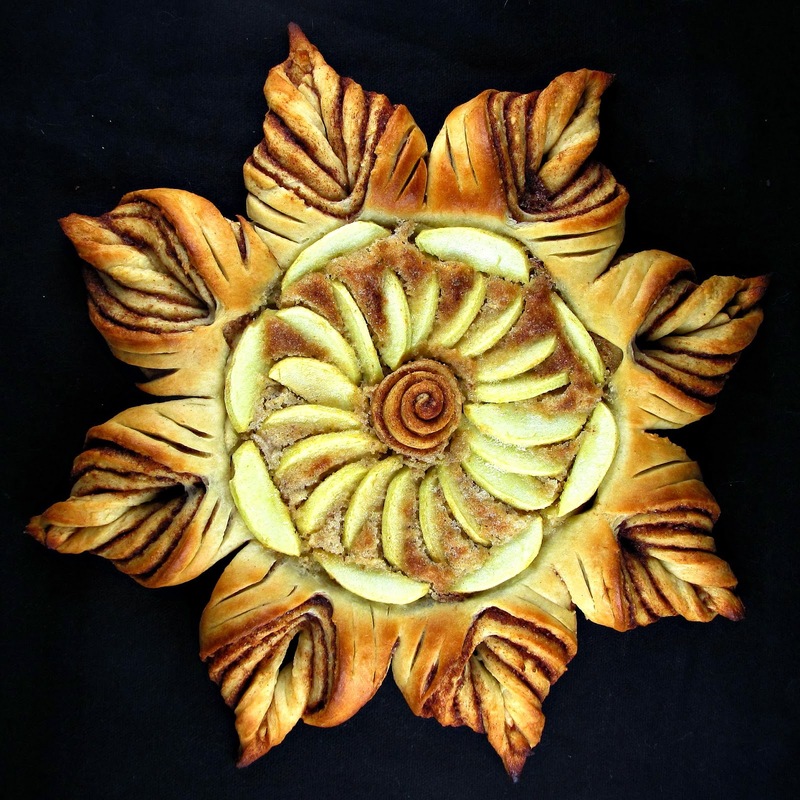 If you have any specific questions on the techniques I used for the different components of this cake, just let me know. Enjoy! So lovely and great idea using herbs as natural dye! Thank you! 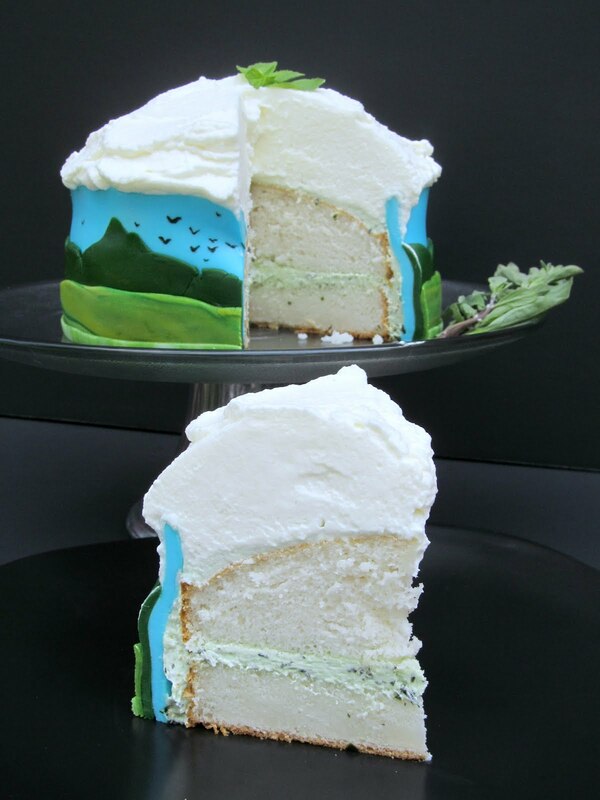 I love the idea of the natural flavors and color that comes through in this frosting. It will be fun to play with different combinations of the fruits of my garden! Wow! What a gorgeous cake!!! Trippy is a good way to put it! Thanks! Oh my gosh!!! This is the most creative and beautiful cake I have ever seen!! I love how you incorporated herbs into the buttercream, and I love love love love the landscape work!! SO STUNNING!!! Wow, that's a very nice compliment! This was one of those lucky times that an art piece came out better than I imagined. I can definitely see what all fuss over fondant is all about. It's completely awesome!